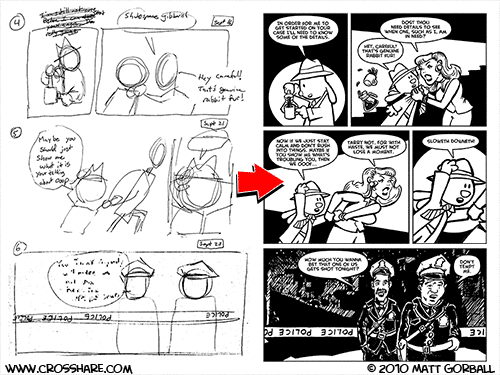 When I started drawing Cross Hare comic strips, I never thought beyond individual strips. I had picked some old newspaper strips that I liked and figured out how tall and wide they were. This determined what size I would make my Cross Hare strips. After I had drawn about 30 strips, I attempted to combine them into a book. It wasn’t going to be a professional printing job. I was just going to print the pages out on my cheap desktop printer and staple them together. I soon discovered that my strips didn’t fit well on a comic book sized page. I should have realized this would be the case. After all, I had collected anthologies of newspaper strips for years that were odd sizes. All of my Calvin and Hobbes anthologies are either in a small 9 X 8.5 inch format, or a larger 8.5 x 11 size. For some reason, I really want Cross Hare to fit into a standard comic book size. So, with my latest storyline, I’ve been planning out pages in advance. As you can see above, I’ve planned 3 strips that fit neatly into one comic book page. This also ads more structure to my previous writing habits. Originally I was just sort of outlining a story or strip with a sentence or two and then worrying about layout and dialogue the night I posted the strip. With this new process, I’ve got all the drawings and word-balloons planned and laid-out weeks in advance. Seems like a no-brainer now, but it’s taken me a while to realize this is a more efficient and more organized way of doing things. What do you think? Am I doing something terrible by abandoning a newspaper comic strip format? Or do you like the new format that I’ve been using? one look at my own comic’s archive and you can see that i’ve had formatting problems for years. i’ve learned that the best decision is just to pick a format and stick with it. really, when fans buy a Cross Hare book, they aren’t going to be dissuaded by the shape of the book, and if your decision to go with comic-book format is only going to strengthen your story-telling, stick with it, matt. I liked the newspaper feel of the strip, and certainly noticed the change, but I can see the appeal of comic book size pages for purchase. I’ll get used to it, so if that’s what you want, go for it. Plus, I’m not someone who should be telling you how to make your strip. No no. Do tell! I really do like the newspaper format, but it can get really cramped at times. I’m currently working on laying out my first 100 strips or so into a print format. I had actually considered getting all 100 printed up on newsprint and making my first anthology of Cross Hare one big newspaper. The first 100 strips collected to look and feel like a big newspaper? That sounds very unique, and it fits in well with the retro style of the comic. Sounds great!nnI like both the strip and page formats. Whatever works best for storytelling works for me! Interesting how the concepts differ so much, but if you can have a punchline for each individual daily strip it works like a newspaper strip. And if you have one page turner like the illustrated example, it flows together nicely into an integrated story. You can still throw in a disconnected strip into the dailies and leave it out of the (comic) book.nnTalk to printers about the newspaper idea. The guys who do the little tabloid size papers would be the ones to talk to about run size and all that. One problem would be damage in shipping them to you and from you and third parties keeping them undamaged in stores. Unless maybe you’re thinking of getting out the old Schwinn and delivering them yourself — cool!nnBut the newspaper idea is great, fits with the film noir theme and woud still work in a book/comic book. You could lead a story off with a realistic vintage newspaper headline, photo and story, then segue into the Cross Hare story. Strips can be imbedded into partial classified ad pages with copy you may or may not write. You could do the Palisades Park comic book ad with The Landlord in it instead of Superman. Or not.nnStill, on the interwebs, you can go nuts with one whole comic book page-sized strip and still have it fit well into a book concept. Are you doing something terrible? Not at all! This is the web! You can do almost anything online. Planning it so it fits into a comic book size just makes good sense.